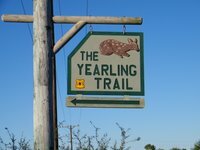 [During the filming of a recent documentary, I journeyed up to “The Yearling Trail” in the Ocala Forest. This is a story about that visit]. The river leg of our “In Marjorie’s Wake” film may have ended, but we are still poking about in the folds of our story before we finally reconverge at Cross Creek. Our film is more than just the recreation of Rawlings’ historic “Hyacinth Drift” river journey, of course. There are many “characters” in this documentary–Marj and Dess, Leslie Poole and Jennifer Chase, the rivers and their wildlife, the river-influenced art, and of course, the way Marjorie Kinnan Rawlings herself learned to pay attention to it all. Her skills as a narrator and her ability to listen and record the world around her were profound. As a human, she was imperfect, as we all are. But as a writer she transcended her mortal life, and taught us something about ourselves along the way. For now, Bob Giguere and I drive up into the Ocala National Forest to hike and to shoot some footage along The Yearling Trail, west of Lake George. I have always found a singular beauty in the rolling pine landscape of the “Big Scrub,” and have always cherished the springs here. I have scuba dived into Alexander and, during another project, into the chasms of Salt and Silver Glen. On other trips, I have paddled the runs of those springs along with that serpentine sliver of ether that flows out of Juniper. While I know the scrub and sandhills on public land not far from my home in Sanford, I am less conversant with that of Ocala. The visit today gives me the chance to better understand the intimacy Rawlings once knew here with both the landscape and its people. Earlier, Bob and I had traveled to the Smathers Library’s Special Collection at the University of Florida in Gainesville where archivist Flo Turcotte graciously arranged for us to have a look at the Rawlings memorabilia willed to the school. We both put on white gloves, Bob to shoot and myself to sort through files of photos, letters, old home movie footage, and original manuscripts. 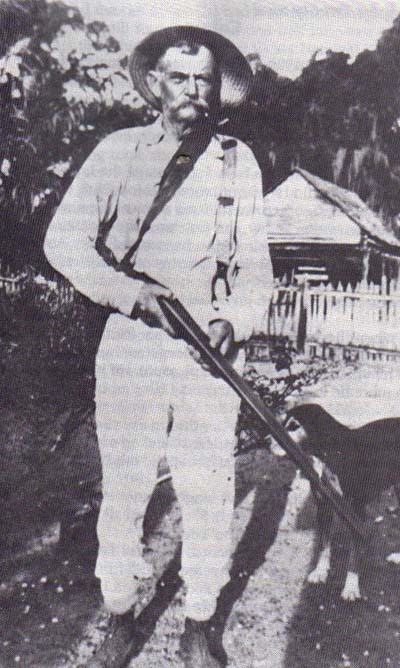 There were photos of the Fiddias, with whom Marj stayed when researching South Moon Under, and of Barney Dilliard, who was preparing to skin a bear he had shot. Dilliard’s story of a giant, marauding bear made it into The Yearling where the bear was immortalized as “Old Slewfoot.” Another showed Calvin Long with a hunting dog, holding a shotgun in front of his homestead on Pat’s Island. Here, I also saw an astonishing 1938 map of the Ocala Forest where Rawlings had scribbled handwritten notes to identify the real places she had fictionalized in The Yearling. On the map, Pat’s Island in the scrub became “Baxter’s Island.” Other notes marked where the “first tangle with Old Slewfoot” took place on Juniper Creek run and identified the fictional “Forrester’s Island” as “Hughes Island.” I sifted through a chronology of old photos, from Marjorie at age two to just before her death at age 57. She grew into a pretty, vivacious young woman before my eyes and then, prematurely, grew heavier and jowly, her smiles less frequent. Towards the end, her face was puffy and her eyes were tired and she looked as she were in pain. And, I held the original typewritten pages of The Yearling and of Cross Creek, let my fingers retrace the Courier type and penciled-in edit changes Rawlings herself once made. The moment moved me, to be sure. It was if the yellowed page in my hand was more than processed wood fragments, was in fact an image capturing the split second when information passes between the human heart and the human mind, and is thrust out from the spirit onto the tangible worlds that flash when a spring bursts forth from the limerock, or when a lightening bolt leaps from the heavens to the earth. The creative gust is no less than that; it is simply much better at pretending to be invisible. Finally, we reach the entrance to Silver Glen Springs on SR 19. Just to the left in the palmetto scrub is a sign with a fawn on it that reads “The Yearling Trail.” I am grateful that someone in the national forest service had the good sense to match literary fiction with reality. It is a sunny midmorning during the week and the road we have taken is straight and quiet. The Forest itself is bordered by both the St. Johns and the Ocklawaha Rivers to the east where a hardwood swamp rims the water’s edge. But here, in its heart, its geography is vastly different. It is this rise in the topography, these many square miles of sandy terrain, that serve as the uplands where the great springs of the Forest are recharged by rainfall. We pull over and walk to the trail head kiosk where we find some description of the literary heritage of the landscape. 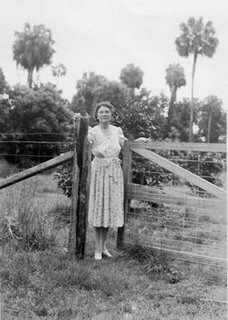 We learn that “Pat’s Island” is one of the most popular historic attractions in the Ocala National Forest. Here, of course, an “island” is not surrounded by water but instead is a fertile, cooler hammock of longleaf, wiregrass and turkey oak in a virtual sea of rolling, arid scrub. I shoulder the tripod and Bob the camera satchels, and we hike a trail, past the low saw palmettos and the gullberry and the little wild blueberry bushes, tiny leaves reddish and shiny. It is November but after a mile or so we are both covered with sweat. We find the old cemetery where the extended Long clan is buried, a tiny plot of grave stones surrounded with a dilapidated picket fence. The air is heavy, no sound but that of our own breathing. From the kiosk, I learned that a Rueben Long first came here in 1872 with his family. Others followed, and by the turn of the century the population of the 1,400 acre island peaked when about a dozen families worked the land, making a meager living with small crops, cattle, hogs, fishing, and moonshining. By the time the National Forest was created here in 1908, many of the original settlers had sold or leased their homesteads. When Rawlings visited descendent Calvin and his wife Mary Long in 1933, they were the only ones left. Calvin told Marj colorful yarns of the scrub, narratives made real because story telling was still an art then. Rawlings heard the tale of a fawn being nursed to a yearling by one of the Longs when they were young boys. My time here in the Long cemetery under the hot Florida sun is difficult to fully process. It means fiction and history have met and that the poignant, heartbreaking stories that Rawlings told so well were once lived by men and women and children, and that many of them–the prototypes for Penny, Ma and Jody Baxter–are still here, beneath the sandy graves at my feet. The wondrous irony is that there were plenty of people throughout Florida living hardscrabble lives, scrapping together a subsistence existence from the land and its rivers. Some were courageous and some were not, but they were all human, with deeply abiding human qualities and human frailties; they laughed, loved, lived, died. A writer brought some of them back to life, and then with the grace of a god, animated them so that the eternal amalgam between her heart and theirs became one. And now they are all gone, the evidence that they lived at all found here in this place, and in the stories of the books one human once wrote. We pack up and leave the little cemetery, hoping to find our way to the sinkhole, the one the fictional Baxters used to draw water for drinking and washing. We walk from the open, hot scrub into the hammock where it is cooler and more pleasant. A hammock is not unlike a river, because you can no longer see straight ahead across the horizon; your vision is blocked by oaks and pines, and the trail inside of them seems to meander, almost without purpose. A hammock begs a story to tell what is behind the next tree, the next thicket of muscadine vines. Jody’s little friend Fodderwing in The Yearling saw “Spaniards” in the hammock, willing mythic images from the mystery of the dark woods. And, Rawlings herself wrote of the enchantment found in the dim light of the hammocks, and how comforting it was for her. Suddenly, the edge of the earth falls away and the entire terrain descends into a giant earthen hole, steep sides thickly colonized with foliage. This was the Baxter’s sink, where limestone catchments held tricklings of water from the slopes of the sink. With no well, it was the only fresh water for miles around. I stumble cautiously down the edges to the bottom, and look carefully for water, but see none. The terrain of Florida is much drier now than when Rawlings lived here. We have drained over half of our wetlands away, and our springs are now declining in magnitude because of over-use and the loss of places where rain once replenished them. Perhaps the “pure filtered water” that seeped into the sink from lateral limestone veins in the earth has been compromised by all of this. At the lip almost a hundred feet above, I see Bob, and he is dwarfed by the scale of it all, a stick figure in the midst of all the shadowy green. With a child’s eye, he could easily be a Spaniard moving in and out of the narrow shafts of sunlight. 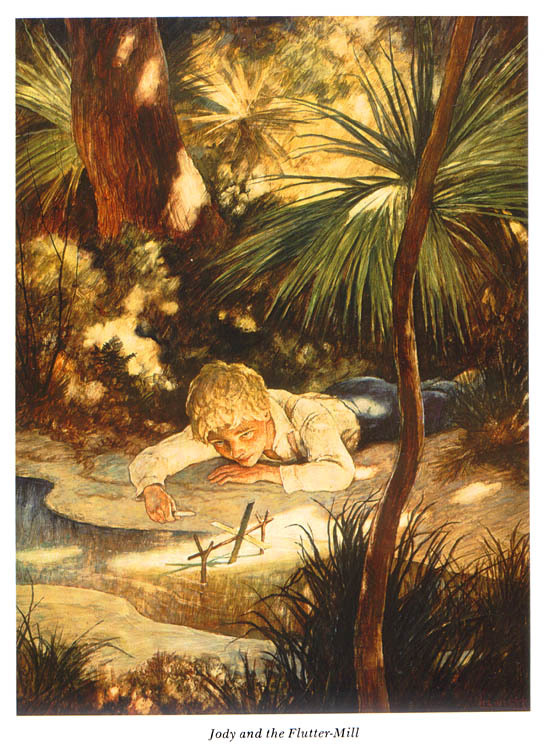 The day is growing long and I am still anxious to visit the little spring where Jody built his fluttermill. It is the sort of place I would also have loved as a child, the sort of place I still love now, really. Most of my own wonder for nature as an adult comes from that nascent awe I first experienced as a little boy, walking in the woods with my dad, fishing, and hiking for miles through the countryside. The sand boils still roil today, small gambusia and killifish skirting about the edges of each, and the roils flatten out into mirrors of light, and just as in Jody’s time, they flow out to the great river and then to the sea. Bob fiddles with the camera, shooting some footage of the tiny spring. I build a crude version of a flutter mill, and for a few precious moments, watch it spin about in its own beginnings, poetry and science and a boy’s dream captured in this moment, in this place, just for now. The peace it gives me is immeasurable. And then we pack up and leave the timelessness of the hammock and return to the harsh glare of the sunlit world with its roads and traffic and all its grown-up chores. And I think with great nostalgia, of the stories Rawlings told, and of the life I have known as a man growing up in the South. And I have a great longing for it all, both for my own reality as well as the natural world Marj saw and imagined, a mythical place cobbled together from springwater and dreams and old timely yarns. Maybe, a boy ain’t a boy too long. But if he works at it, he can carry a sense of wonder with him that lasts a lifetime. Thanks, Patty. We postponed a trip planned to the Trail because of the fire. Nature will return, surely, but am hoping none of the human-made stuff (like the cemetery) was damaged. Wonderful story. My youngest son and I hiked that trail many years ago. I was shooting film then and not particularly happy with the results. This reminds me that I should go back with the digitals. 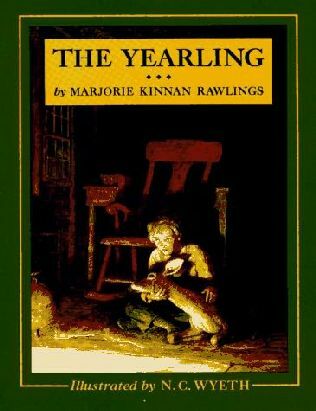 I read the Yearling to my sons when they were young and they loved it. Thanks for the kinds words, Mark. Glad you got to see if with your son. The sink, Long cemetery, and “Jody’s Spring” were my favorites. A recent wildlife just blew through there, so am unsure what condition the trail is in right at the moment. Are there still squatters/homeless in the Ocala National Forest, especially the campsites? There were comments on discussion boards detailing the antics of the “Rainbow” groups (drug use, using the woods for a toilet, stealing, threats of violence, assault). The impression I got is the folks “squatting” at the campsites were homeless, and generally were not part of the seasonal “Rainbow” people event. As you likely know, Florida attracts more than its usual share of transients. The two murders there over the last several years were not the work of misguided hippies, but of a couple of sociopaths who used the remoteness of the massive forest to afflict themselves on others. That said, I seldom encounter anyone on the trails and dirt roads but other hikers. BILL !! Thi sis from JIM at Urban Think! Bookstore– can you contact me at 407 650 8004 as soon as you can? I couldn’t find your eMail address! Hi Cathy- Thanks for the great info. I’ve never seen a credit with those photos, and it’s great to know the origin of them. What was your dad’s name? Did he ever chronicle any of his photo experiences with MKR? Would love to know more about this; feel free to contact me directly via the email address. The photo on the top of the page is one I took at Welaka right after dawn one morning. Shot it from a boat on the St. Johns. We were fogged in pretty good then and were looking for gas for the boat. Hey Bill, I just became aware of your reply. I would love to communicate with you but am not able to figure out where your email address is! so please write me….this site is just amazing….. Thanks for the nice comment on the site, Haley. Really neat to have a connection like that with Barney Dillard in your family. (Have since learned of his protection of the old oak there at the river bridge at Astor when DOT was ready to remove it. ) Very reaffirming that stories still live on, not just in books but in the landscape. I would like to get in touch with you ASAP. My father is Claude Jarman Jr. Jody in the Yearling. We are coming up tomorrow to visit the area. For him it will be the first time since the filming. I want to know what still exists today in the way of markers for the Yearling. We would like to visit some of them. I saw at ocala.com that your father was at Silver Springs yesterday. I hope that he was able to enjoy his time here. I know we are so Blessed to live in such a Beautiful area! The Yearling Trail is located on the west side of US 19 near the entrance to Silver Glen springs (which is to the east). US 19 runs N-S through the Ocala National Forest and is easy to find on a good map. Several sites—as mentioned in my essay—are interpreted as part of the Trail. As you know, Mrs. Rawlings used a lot of real-life locales in her fiction. The sinkhole the “Baxters” used to collect water is there, along with the small sand boils (across the road at Silver Glen) where Jody built his fluttermills. The old cemetery where the Long Family is buried is also included, as is the foundation of their home when they lived here in the Big Scrub. Greetings, Bill….So happy to find your beautifully written and very informative narrative this morning, thanks for posting on the web, a wonderful tribute to M.J. Rawlings. I just returned from a weekend visit in the Ocala Natl. Forest with an older gentleman who has been familiar with the area since the early 1940’s. We still managed to get lost in the Juniper Prairie, traveled the beautiful yellow sand road to Pat’s Island, where we saw beartracks near the parking area, experienced the quiet isolation of this unique area that you described so well, wandered through some forest trails at Silver Glen, where evidence of the ancient, pre-Seminole native americans can still be seen in the extensive apple-snail middens that ring the springs there. On our return to “civilization”, I had hoped to find out more about the Longs and about this remote area they settled. Your post above rounded out the experience so well, for me and I’m sure for many others. I wish the park could include your website on their Yearling Trail brochure. Thanks for your dedication and perpetual state of wonder! Thanks, Linda. Sounds like you guys had fun out in the Forest; it’s kind of neat there’s still enough land out there to truly get you lost ! The interpretation of the Yearling Trail is really nicely done—so much literary history there. Glad you guys had a chance to enjoy it.